Put the potatoes in a saucepan of cold water. Bring to the boil and cook over medium heat for about 7-8 minutes or until tender when skewered. Add the beans for the last two minutes of cooking time. Drain and rinse in cold water, then drain well again. Quarter the potatoes and place in a large bowl with the beans, tomatoes, olives, mushrooms, tuna and capers. Whisk together the olive oil, vinegar, anchovies and season with pepper and salt if desired. 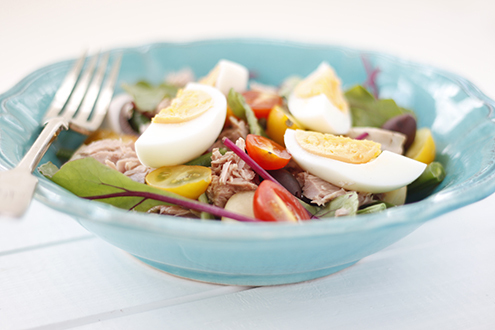 Toss the salad with the dressing and serve topped with egg quarters.